The bacteria residing in your digestive tract, or your gut microbiota, may play an important role in your ability to respond to chemotherapy drugs in the clinic, according to a new study by scientists at the University of Massachusetts Medical School. Published in Cell, the study by Marian Walhout, PhD, and colleagues show that when a common research model, the roundworm Caenorhabditis elegan, is fed a diet of E. coli bacteria, the worms were one hundred times more sensitive to the chemotherapy drug floxuridine (FUDR) than worms who were fed different bacteria. FUDR is a commonly used drug to treat colorectal cancer. Cancer doctors have long been puzzled by how dramatically different two patients with the same disease can respond to the same treatment - even in cases where twins, who are genetically identical, have the same diagnosis. "Two twins, genetically identical, who have colorectal cancer could potentially respond very differently to the same treatment because of their microbiome," said Dr. Walhout, PhD, the Maroun Semaan Chair in Biomedical Research, co-director of the Program in Systems Biology and professor of molecular medicine at UMMS. "If we can learn how bacteria affect the efficacy or toxicity of chemotherapies, it's not hard to imagine developing personalized medicine built on probiotics that could improve the clinical benefits of some cancer treatments." Walhout and colleagues used the humble model organism C. elegans, a transparent, microscopic worm often used in genetic studies, as a correlate for cancer to determine how different bacteria might augment or depress cancers drugs. Feeding C. elegans an exclusive diet of either E. coli or Comamonas bacteria, Walhout then exposed these worms to different chemotherapy drugs to assess both changes in phenotype and genotype. One of these drugs was the antimetabolite FUDR, used to treat colon cancer. Worms fed a diet of E. coli were much more sensitive to FUDR than worms fed Comamonas. These worms had dead offspring or were completely sterile, depending on the amount of FUDR. Worms fed a diet of Comamonas, however, produced live offspring at the same doses. Worms fed the Comamonas diet had to be exposed to a concentration of FUDR 100 times greater than E.coli fed worms to induce sterility. To produce this effect, the bacteria needed to be alive in order to actively metabolize the drug or to produce a metabolite when exposed to FUDR. 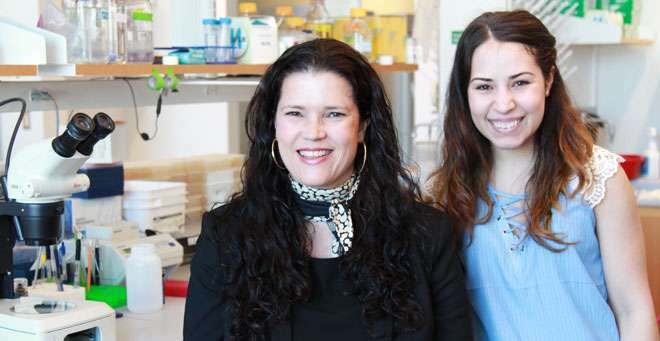 "Because these are bacteria already in your microbiome," said Aurian Garcia Gonzalez, a MD/PhD candidate in the Walhout lab, "any pill or treatment you take orally would be exposed to the bacteria and the efficacy of the drug may be modulated by different bacteria." Genetic screens were then used to determine which bacterial genes are responsible for increasing or decreasing drug efficiency in C. elegans. This allowed Garcia Gonzalez to gain insight into the molecular mechanisms responsible for improved FUDR treatment by identifying bacterial mutants that improved or diminished drug potency in the worm. "This isn't a model that indisputably demonstrates a therapeutic finding but the implications are quite interesting nonetheless," said Walhout. "Using the humble worm and powerful genetic tools, we can potentially use probiotics to develop a personalized medicine that might maximize the benefit of some chemotherapy treatments. "Any bacteria that can be fed to a worm can be tested and any drug that has an observed phenotype can be tested," explained Walhout. "This gives scientists a huge space to test because of the thousands of combinations of drugs and bacteria that could conceivably be tested. "We hope this study inspires more people to look at this space, and explore the use of our findings to clinical settings in the future."